Are you looking for a mental health group to attend? Kaleidoscope Plus Group have approximately 80 different groups. Visit the website, www.kaleidoscopeplus.org.uk, to find out what is happening in April. We are pleased to invite you to an event that will tell you about the National Lottery Heritage Fund’s new funding framework and National Lottery Grants for Heritage. Over the last six years, the National Lottery Heritage Fund (formally known as the Heritage Lottery Fund) has supported 50 new projects in Sandwell, totalling over £6.33 million. If you are interested in applying or considering applying for funding for a heritage related project, this is your opportunity to find out more about what’s involved, check your eligibility to apply and find out about this new funding programme. Jackie Lee, part of the development team at the National Lottery Heritage Fund’s Birmingham office will lead the event. She will explain how the new funding framework provides a simpler and more flexible funding offer. She will introduce the audience to the new single open grants programme, which is for all types of heritage project, and which includes new resources and digital guidance on the website to support applicants. This event will help you recognise the range of heritage and activities National Lottery Heritage Fund supports and explain how you can access guidance and advice that will help your develop your heritage project idea. The event will take place on Thursday 11th April 2019, 10am until 1pm in SCVO’s Board Room, 1st Floor, Landchard House, Victoria Street, West Bromwich, B70 8ER. Registration opens from 9.45am for a prompt 10am start for those booked onto the event. This event is targeted primarily at those groups from Sandwell’s voluntary and community sector and groups whose main beneficiaries live in Sandwell. Groups from outside the borough may attend but priority will be given to Sandwell groups as above. There is a maximum of 25 places available for this workshop. Please book two tickets only per organisation. All places must be booked through Eventbrite by clicking here. **PLEASE NOTE** – a cancellation policy applies to the workshop bookings – details will be provided at the time of booking. There is NO public car parking available at Landchard House. However, there is plenty of on street and pay-and-display parking in the immediate vicinity, We are (more or less) opposite the Lodge Road Metro stop, and within 5 mins walk of West Bromwich central bus station. The England Illegal Money Lending Team is running a free training session on How to Spot a Loan Shark on Thursday, 14 March 2019. This training is aimed at anyone who is involved in providing a front facing service with customers. There will be a Questions and Answer element to the training. How to Spot a Loan Shark will give in-depth information about the illegal money lending, key things to look out for as a frontline worker, the relevance of loan sharks for your organisation and a better understanding of information and intelligence. Attendees will also be shown the impact that loan sharks have on victims, families and communities. The training will benefit staff who have an involvement with households’ finances and poverty issues, to raise awareness of how the symptoms of financial distress may present themselves and give an overview of key resources available to your client group. Click here to book a place. 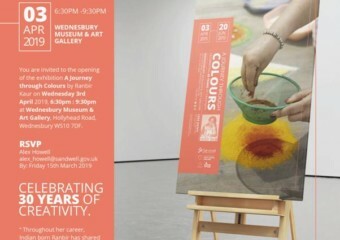 A Journey through Colours is a new exhibition by one of Creative Black Country’s 100 Masters, Ranbir Kaur which will be taking place at Wednesbury Museum and Art Gallery from 3rd April – 20th June 2019. Ranbir is a national and international recognised Rangoli artist , this will be her second exhibition in a major museum where she is presenting her entire work to date. A highly celebrated artist, Ranbir has received many awards and create the largest Rangoli in the World in Nottingham that has since entered the Guinness Book of Records. Free Entry into Wednesbury Museum and Art Gallery, Holyhead Road, Wednesbury, WS10 7HD. Last admission 30 minutes before closure. SCVO in partnership with the National Lottery Heritage Fund are planning to hold a Heritage Fund Launch Event on Thursday 11th April 2019. The Launch Event will take the participant through the recent changes to the Heritage Funds Grant programmes, who is eligible to apply and the processes you will need to follow to access these funds. Heritage can mean different things to different people, it can be anything from the past that you value and want to pass on to future generations. The Heritage Funds Grants Officer will discuss what heritage means to them and how you can access grants to support your heritage project. National Lottery Grants for Heritage will provide funding for all types of heritage projects with grants starting from £3,000 upwards. They want to inspire, lead and resource heritage projects across the UK, to create positive and lasting change for people and communities, now and in the future. This event is free for Sandwell voluntary and community sector groups and groups whose main beneficiaries live in Sandwell (subject to attendance). For those wishing to attend the workshop from outside of Sandwell there will be a small booking fee. Further details to follow so watch this space! “Do you have an idea for a creative project but need some advice? This May, Creative Black Country are hosting four surgeries with Arts Council England, on how to apply for Arts Council Project grants and Creative Black Country’s Open Access Awards. The session will take place on 23rd May 2019 between 2.30pm to 4.30pm at Sandwell Business Solutions Centre, Sandwell College, 1 Spon Lane, West Bromwich B70 6AW and will contain a presentation on applying for Project Grants from Arts Council England and there’s the opportunity to book a one to one session with an Arts Council representative to discuss project ideas, receive advice into funding bids and much more. This event is for individuals, groups or organisations who are interested in finding out more about Arts Council’s Project grants work and bringing creative work/activity to the Black Country. It’s a good opportunity for Black Country creatives to meet with a representative from the Arts Council and connect with Creative Black Country. They will be given valuable insight and advice into the application process for both Arts Council Project grants and the Open Access Awards. It’s also an opportunity to network with individuals, groups and organisations who are looking to deliver creative activity in the Black Country. 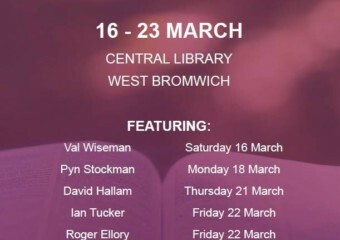 Sandwell libraries are running their first literature festival during March at Central Library in West Bromwich. The literature festival runs from Saturday 16 to Saturday 23 March and includes storytelling, local history talks, author events and musical performances. The opening event on Saturday 16 March is The Brontë Legacy – Keeping The Flame Alive, a musical tribute to the Brontë family in a series of songs based on their poetry and characters by award-winning British jazz singer Val Wiseman, who grew up in West Bromwich. The event starts at 7pm and admission is £3 in advance or £5 on the night. Councillor Syeda Khatun, Sandwell Council deputy leader, said: “Our first literature festival promises to be a real feast of exciting entertainment and fascinating talks, all in our wonderful Central Library in West Bromwich. An illness or injury and a hospital admission can be a difficult and life changing experience. Many people face this alone, or with little support. Having someone there in the weeks following discharge to provide practical support, listen, comfort and reassure can transform lives. On Saturday, 9th March, 10 am to 1 pm, Home From Hospital Care, a charity providing aftercare for people who have recently been discharged from hospital, in Sandwell and Birmingham, is holding a Volunteer Open Morning at St Martin’s Church in the Bullring. This is a drop in event where staff from Home From Hospital Care will be available to talk to prospective volunteers about the charity and the volunteering role. For more information email admin@home-from-hospital-care.org.uk or contact Rosalind Ejenavi, Aftercare Co-ordinator, on 07483 165 930. The purpose of the workshop is to discuss and agree how solutions and opportunities can be implemented. The briefing, aimed at those from frontline/voluntary and community groups will provide an overview of the scheme. In addition, an update on the vulnerability strategy and the additional support the Home Office is making available for more vulnerable or at-risk EU citizens and their family members. During the session, there will be an opportunity to look at local needs in relation to the scheme, and to discuss what actions are required to address these issues together. 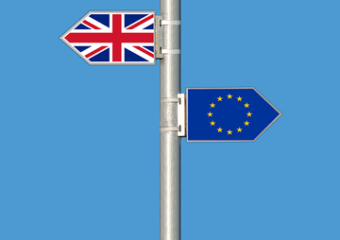 Attendees will also be presented with the communications tools and resources the Home Office has developed for frontline organisations to help them inform and reassure EU citizens.